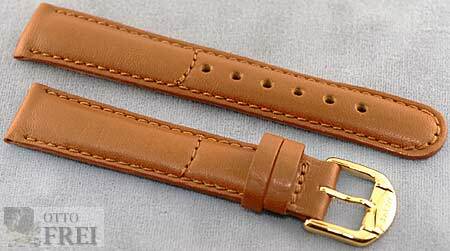 18 mm light brown leather strap with light brown stitching, yellow buckle. 18 mm width by 16 mm buckle, total length of band is 7 1/2". 18 mm black leather strap with black stitching, yellow buckle. 18 mm width by 16 mm buckle, total length of band is 7 9/16".